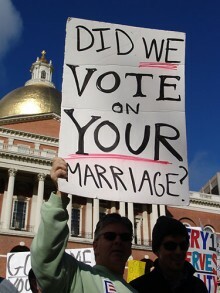 Four Catholic bishops from Washington released a letter on Tuesday attempting to coerce their combined 800,000 flock into voting down marriage equality at the Referendum 74 November ballot. What Seattle Archbishop J. Peter Sartain, Spokane Bishop Blaise J. Cupich, Yakima Bishop Joseph J. Tyson and Seattle’s bishop Eusebio Elizondo, have actually stitched together is a list of the same tired and baseless arguments against marriage equality that we have heard time and time again. Here they are, lifted straight from the letter, and here’s why they shouldn’t fool anyone. Posted September 11th, 2012 & filed under News.